If you’re looking for a new type of photography to play with, infrared imaging with digital cameras can easily become your new playground. By ignoring visible light and capturing subjects solely by the infrared light they reflect, you can picture the unseen — in more ways than one. That’s because, thanks to the magic of the digital SLR, you likely have to shoot blind. The same techniques that shield your sensor from visible light also keep you from seeing anything through the viewfinder. Fortunately, work-arounds exist. 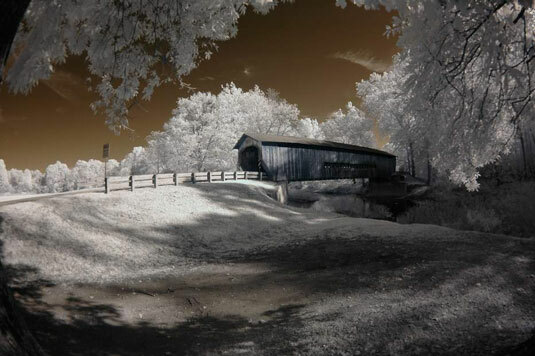 Infrared photography lets you render foliage in eerie shades of white and the sky in an unearthly black color. Human skin takes on a soft, fuzzy glow. You’ll either love or hate the effects. First, get your camera set up for infrared photography. Because digital camera sensors are highly sensitive to infrared illumination, most camera vendors try to filter this light out by placing a filter called a hot mirror in front of the sensor. Some hot mirrors are more effective than others. You can test your dSLR for infrared compatibility by taking a picture of a TV remote control pointed at the camera in a darkened room with a button on the remote depressed. If a spot of light shows up in your image, your camera is sensitive to infrared light. Get a filter that blocks visible light while letting the infrared illumination through. Try the Hoya R72 filter, but some photographers have reported success with Wratten #87, #87C, #88A, and #89B filters. Set up your camera on the tripod, compose your image, and then place the infrared filter on the lens. Unfortunately, after you place the filter on your camera, the view through your finder is completely black. Infrared exposures are likely to be very long (up to several seconds in duration), so use a tripod. Set your white balance manually (check your camera’s user guide to see how to set a manual white balance) by using a subject that reflects a lot of infrared. Grass is a good choice. Take a few pictures by using manual exposure. Small f/stops lead to even longer exposures, but your tripod keeps the camera steady. Start with an exposure of 0.5 to 1 second and then double the exposure time for each successive picture. You might be able to see an image on your camera’s LCD after the shot and gauge exposure that way. Play around with your pictures in your image editor to adjust brightness, contrast, and color.